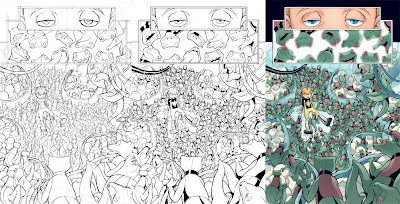 Gurihiru-Blog: Power Pack: Day One #3 On Sale ! 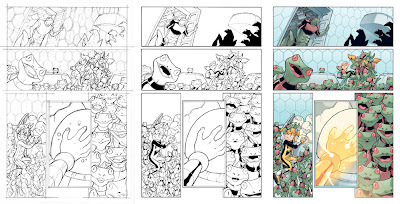 Power Pack: Day One #3 On Sale ! May was a busy month for me and I come back. 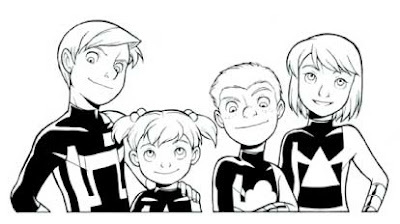 Finally finished the Power Pack issue today. Thank you for all comments and visits! 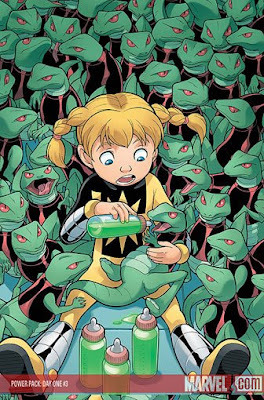 Power Pack Day One #3 arrived in stores on May 28 from published at Marvel Comics. Written by Fred Van Lente, with art by Gurihiru. The preview in this issue is here. I came up with a concept of this cover because I saw the photograph of the girl who was giveing a racoon baby a bottle. This cover was very popular with editors. 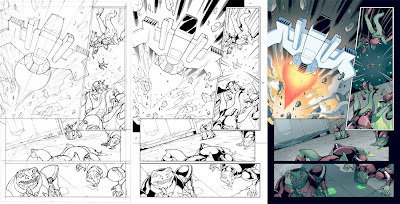 Here's some of my process... Other three pages from "Power Pack Day One #3". Hi I just wanted to say I love your artwork. I had a question though. How do you solve copy right stuff? I just realized I have work on my blog that I no longer have copyright over. Should I take it off? Or put a water mark on it or write a note under it. Just wanted to know your thoughts. And one more time... I really love your artwork!!! colby -We clearly don't understand the situation that you don't have the copyright anymore. Since we can show our past work like a portfolio, we just put them on our web. If we are asked to put the copy right by the client, we make sure we indicate it at the bottom of the image. If you want to know clearly, it may be good to ask your client directly.